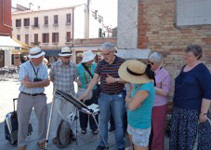 After a very enjoyable & successful painting course in Venice earlier this year, West Norfolk Arts have asked me to tutor a course around the Northern Shoreline of Lake Garda in September 2013. It would be great if you could join me! We will be painting in and around Riva del Garda and on full day coach excursions to Arco, Gargnano, Malcesine and by boat to Limone. The week will include plenty of demonstrations, group tuition and one to one guidance. My demonstrations will be in Watercolour. We'll be staying at the four star Hotel Luise in Riva del Garda on a Dinner, Bed & Breakfast basis - all meals are buffet style. The hotel is set in private gardens with an outdoor swimming pool. Accommodation is en suite with telephone, air conditioning, TV, safe, wi-fi, hairdryer & coffee / tea making facilities. If you'd like to join me, please contact West Norfolk Arts for more information. I'm really looking forward to it....hope to see you in 2013! !